← Jamaica Bay Restoration for JFK Airport Expansion? As our summertime weather turns spectacular in time for the weekend, the beach is getting pretty tempting. While the past two days have seen a dropoff in water temperatures along Long Island, the good news is that they are back on the rise. They briefly fell down to the low-to-mid-60s, but are projected to rise back to 70 degrees for Saturday and Sunday. Below, you can see that while the Jersey Shore is basking in low-70’s water temperatures, Long Island beaches are much cooler. 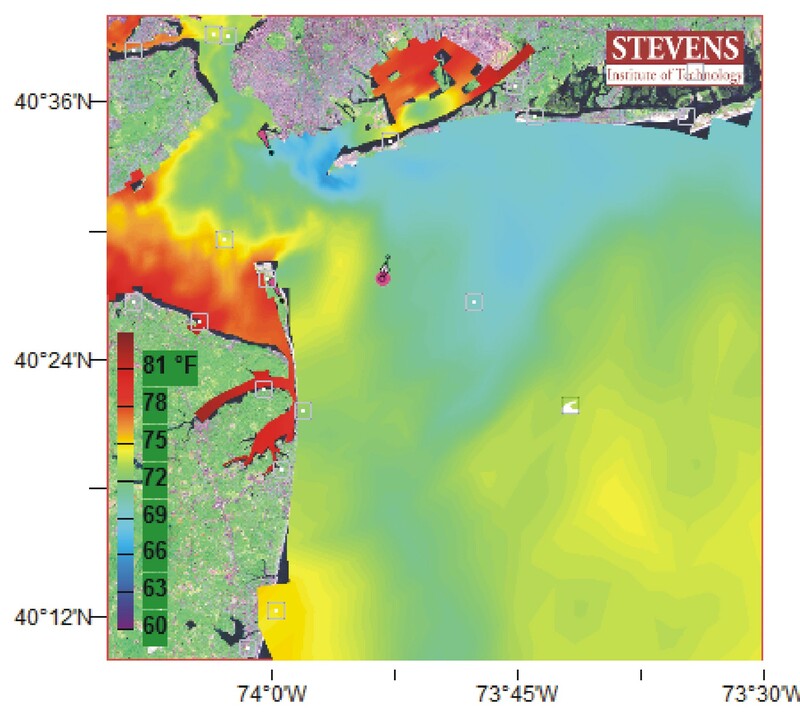 NYHOPS modeled sea surface temperature map for the afternoon of July 14th, 4:00pm. Long Island is at the top. The reason for this dropoff appears to have been coastal upwelling — we had 10-20 knot west winds at the coast for two days, and due to Earth’s rotation and the Coriolis Effect, a multi-day period with west winds will begin to drive surface waters toward the right of the wind, offshore in this case. Deep waters up-well from below to replace the lost surface waters, and things get chilly. Due to winds weakening and turning to come from the southwest and south, a more common summertime pattern, the upwelling pattern will “relax”, warm waters will come back onshore, and Long Island’s coastal waters will warm to near 70 degrees by tomorrow evening. That is the furthest that today’s NYHOPS forecast extends ahead. NYHOPS modeled sea surface temperature map for the evening of July 15th, 11pm -- note how the shading off Long Island has turned from a darker blue to light blue, indicating temperatures are rising from mid-60s to about 70 degrees F.
To you surfers and beach-goers: One can access these predictions using the New York Harbor Observing and Prediction System (NYHOPS), by clicking NYHOPS Forecast tab, then the New York Bight Apex button. Of course, models aren’t always right, so it is useful to check these predictions against observations. NYHOPS has already been extensively compared against observations, and generally performs very well. 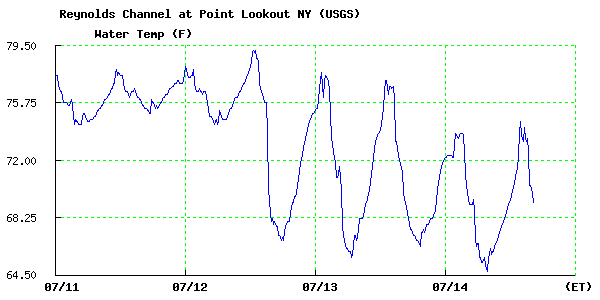 Unfortunately, there’s no beach site in our observation database, but one place with water temperature data that might be useful is Reynolds Channel at Point Lookout, for Long Island beaches. Click on the “Data and Time Series” tab, then choose this station to look at actual observations. The site is at an inlet, so tides affect the temperature, but it can be informative. Here, it shows how temperatures took a dive the middle of this week … in terms of the twice-daily cycles you see, at this time of year, the minima reflect the cool ocean water coming into the inlet, while the maxima reflect the warm inland waters when the tides run out to sea. 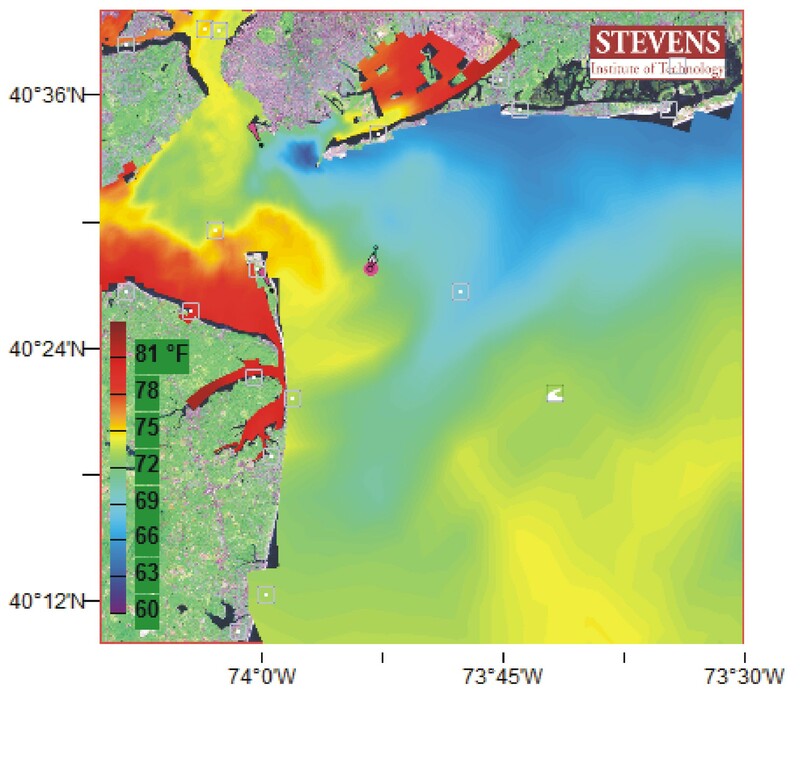 This entry was posted in water and tagged beach, cold, Coney, Coriolis, island, Long Beach, long island, Rockaway, SST, surf, upwelling, water temperature. Bookmark the permalink.